2 Bedroom Terraced Cottage For Sale in Uckfield for Offers in the region of £270,000. Two bedroom terraced cottage situated in a country lane over looking meadows. Lots of character features. This delightful cottage has a cosy sitting room with wood burning stove, kitchen/breakfast room with door to small terrace. Main bedroom with many character features and countryside views. Small bedroom 2/study. Shower Room. The property backs onto a steep wild flower bank and the garden is situated just up the lane with secluded bbq area and raised terrace. Opposite the property is a private parking area. 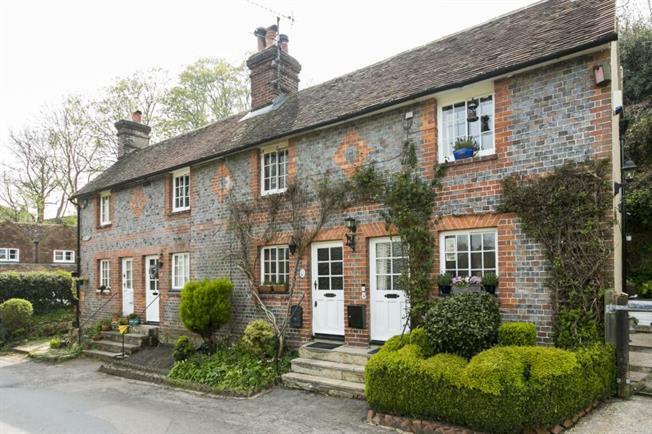 A charming character cottage located in a quiet road opposite local countryside yet just a few minutes walk into Maresfield High Street. The cottage boats a wealth of charm including exposed beams and brickwork, fireplaces and a wonderful vaulted master bedroom. The accommodation consists of a sitting room, kitchen/breakfast room with a central staircase. Upstairs you will find the vaulted master bedroom, a further small bedroom / study and the bathroom. The property owns a number of outside/garden areas close to the cottage. The property benefits from three outside areas - To the rear of the cottage is a covered walkway with a banked planted area. Just up the lane you will find a wonderful garden area with mature planting, the old village well, railway sleeper steps criss-cross the garden and rise to a decked viewing platform offering views across the garden and to the countryside beyond. The other side of the lane is a gravelled area with off-road parking for 2/3 cars and a garden shed. A further hard standing parking area is also provided. Underhill is located within Maresfield village which is in close proximity to Uckfield town centre with Uckfield providing a wide range of local amenities including shopping facilities, schools for all ages and Uckfield railway station. The town also offers a cinema, library, bus station and leisure centre. The coastal towns of Eastbourne, Brighton and the Royal Spa town of Tunbridge Wells, Gatwick Airport and the M23 motorway are all within a convenient driving distance. Also in this area is Ashdown Forest with it's 6,500 acres of scenic walks, riding by permit and the renowned East Sussex National Golf Course.